Our Parenting Place is excited to share its latest collaboration with Endorphinzzz Founder, Irina Shulkin, Health Coach and Certified Holistic Nutrition Practitioner. 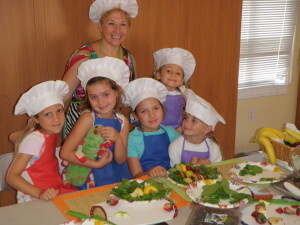 Irina advocates and promotes Healthy lifestyles and helps children gain new healthy eating habits the FUN way – thru her program called Chef Color Raw. • Children love to be in the kitchen. Acting like mommy or daddy do in the kitchen brings mastery to kids and it demonstrates real life – Kids learn best and enjoy doing hands-on activities such as peeling, cutting, arranging, designing, tasting and eating. Cooking gives kids the feeling of control. • Children will have the opportunity to find their inner creativity by preparing and re-enacting recipes. • Kids are naturally curious, in our classes, they will be able to make their own decisions, and this is the first step in gaining self-confidence and to fuel their love for learning and experimenting. • Children will be introduced in a playful manner to a new dictionary of foods; they will use all their 5 senses in these classes. • Children will get the opportunity to explore nutrition, chemistry, biology and botany. • Each class will be documented giving children the ability to express their learning and to share their experiences with others through an interview that will be videotaped and recorded to memorialize the facts they’ve learned each lesson. Videos will be available for children and families to share. Through these steps, children will be more likely to try new foods and become adventurous.